As a mompreneur, keeping on top of everything related to your business can be a daunting task. But it doesn’t have to be that way! In this podcast, learn how de-cluttering and organizing can make you be more productive. 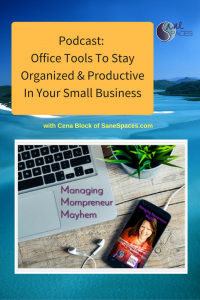 Learn organizing and de-cluttering secrets to be more productive and get more done with this episode focused on planning and organizing for home-based moms in business. OR Go the DIY Route – Click here to immediately download your step by step “Get Organized” Guidebook! If you’re a do it yourselfer – You’ll love this!